The ZADCO Upper Zakum 750 project is one of the largest offshore field developments in the Middle East. The Amarinth order was facilitated through Arabian Industries, an EPC based in Oman. The super duplex pumps, including bespoke baseplates, will be supplied on a tight 25 week delivery. Amarinth will deliver the pumps in two batches, the first six pumps to the South Island and the second six to the North Island. 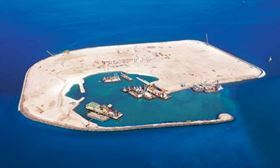 They will be used in the treatment plant that processes the produced water from the artificial islands. Because of space restrictions at the plant, Amarinth is also designing a bespoke baseplate for the pumps that will enable the Plan 53B seal support systems to be positioned over the pumps in order to minimise the footprint.